If you've ventured anywhere near a magazine stand in the last couple of months, you've seen Lena Dunham's face. She covered Vogue in February 2014, and is the star of Glamour 's April 2014 issue. Dunham's style may not be perfect or twee; in fact, she seems to adore wearing clothing that invites controversy. But she consistently chooses garments based on personal preference instead of mass appeal, and celebrates her curves at every given chance. 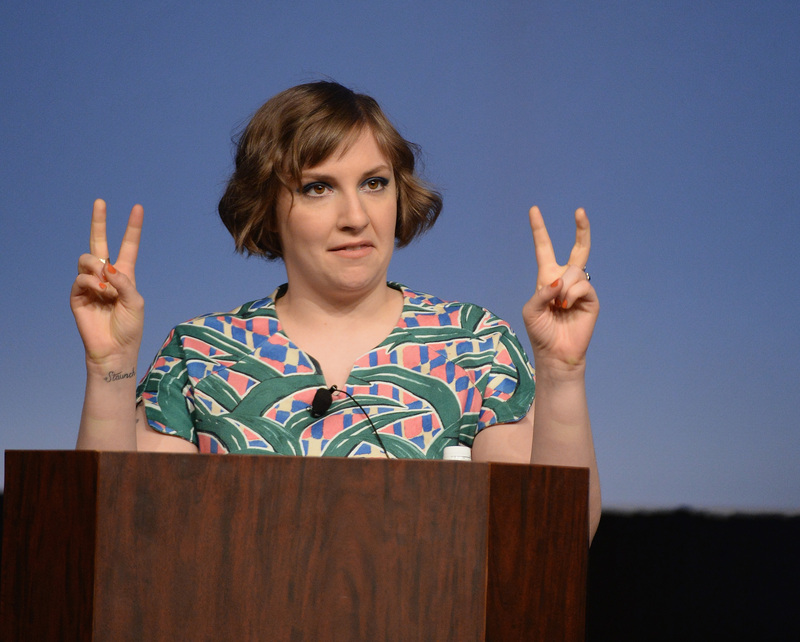 Amidst all of the fanfare, we have to wonder: is Lena Dunham the next quirky, Millennial style icon? If you ask critics, Dunham has a somewhat hit-or-miss relationship with fashion. The Huffington Post scoffed at the silk tunic Dunham brazenly wore without pants to the L.A. Loves Alex's Lemonade Culinary Event. Fashion bloggers Tom and Lorenzo placed her ostentatious Prada gown for the 65th Annual Emmys on their "Worst Red Carpet Looks of 2013" list. And her vibrant yellow Zac Posen gown at the 2014 Golden Globes split the critics at Hollywood Take straight down the middle, causing them to ask if the dress was "cool or crazy." Critics may not approve all of her fashion choices, but we adore her sense of sartorial bravado and quirk. Dunham has done her fair share in helping spur fashion's recent, playful tilt, one which was echoed on the Fall 2014 runways. Her relaxed, lighthearted style speaks to the Millennial sensibility of disregarding fashion conventions in favor of trends like ironic shirts, insouciant high-low wardrobe pairings, and a general vibe of playful eccentricity. Dunham's low-backed, tattoo-exposing neon dresses, letterman jackets thrown over feminine, floral dresses, and print-mixing galore are evocative of the carefree Millennial style. Her recent disco ball Rochas dress, worn to the Girls Season 3 premiere in New York, seemed to be yet another fun-fueled choice; the style seemed neither particularly ultra-trendy, nor a "best dressed list" guarantee, but it sure looked entertaining to wear. I love clothes but I don't care about best dressed and worst dressed lists ... So I get designers I love to make me dresses I'm excited about and then I wear them, and whatever the reaction is, I feel stoked. We're not vouching for Lena's more dubious fashion choices — and there have been more than a few instances of skin-baring that have us scratching our heads. But as a fellow Millennial who appreciates the value of an ensemble that puts a smile on your face, Ms. Dunham has evoked our respect. Even if she never launches a single trend the way Lupita sold a thousand headbands the night after the Oscars, Dunham's free spirit attitude and wry amusement by fashion have, in ways, become hallmarks of Millennial style. Bet she never expected that.